Now I watched this because I watched the original Wagnaria!! If you go read my review of that you'll know that it had left quite an impact on me. So naturally I went into this hoping it would be similar. I hate to say that I was deeply disappointed. This is nothing like the original. It doesn't flesh out the characters or make you care about them to the extent the original did, all of the heaviest romantic points were moderate at best, and the jokes were funny... at first. To be fair if you watched this first without watching the original you may think nothing of it. Its funny to an extent the best romance comes from the side characters, and the main plot is entirely focused around chocolate. I say watch it, it doesn't take long as is decently funny, but if you haven't I would heavily recommend going and watching the original, it is countless times as funny, as romantic, and in general is a much better show. I haven't seen the other anime associated with this show, but I definitely will after this season ends. As my designated breakfast and dinner show, this anime as some great comedy. Nothing lung-busting, but plenty of LOL moments. The characters stay true to their respective stereotypes and roles which makes the humor grow on you as the show goes on. If you enjoy shows like Denki-Gai, you will enjoy this too. A lot of people seem disappointed this wasn't a season 4 when the original series quite obviously ended since the source material had also ended some time before the anime did which takes away a lot of the rep some of the old fans think they have. Some people pointed out there wasn't a balance to the personalities in this one. That is nothing new since in the first series there was no balance either with one of the best couples being a boy to shy to say how he felt and a girl too dense to notice anything about him making it so that if there was no plot they'd never get anywhere like they hadn't in the past 4 years. The main difference is there's a lot more relationships in this series and they make more progress than the original did in a third the time due to the characters actually being able to balance one another out if they tried. Overall with or without comparison to the original this is a good series to watch, especially if you're short on time due how condensed it is in comparison to the original 40ep series. Highly Recommended and www.Worth www.Watching!! The 1st episode is generally just an introduction of every main characters in the story and a little bit of intro about their characteristics, traits, and little bit background info about themeselves. The relationship development may be quite faster than the Original, probably because of the budget and manga content, but still worth 5 stars. The humour is a big OK and it's very fun to watch. Many people are disappointed because this is very different from the original so...Please do not compare this to the original Working because this has different environment with different individuality. The animation is extremely great. The BGM choices are also fantastic. Both Opening and Closing music & animation is also very catchy and you will spot some humor on the animation. It may have less humour than the original, but come on you can't understand the joke unless you know the character first. When you get used to the character, you would most likely get the joke immediately for you know their characteristics already. Enjoy the show!! As for the rate definitely 5/5 on my personal opinion, but 4.5 for having a realistic rate because it still has some bad things that I really don't want to point out cuz I wanna keep the show overrated, since I love it. People need to stop comparing this to the original, people complain about the depth and the characters being "too mean" but personally i feel its hilarious. The premise may be the same but the characters are different, they shouldnt be expecting the same experience as the first. Great little sequel to the Wagnaria series. I wish it was a bit longer, but it had a great plot and great characters. 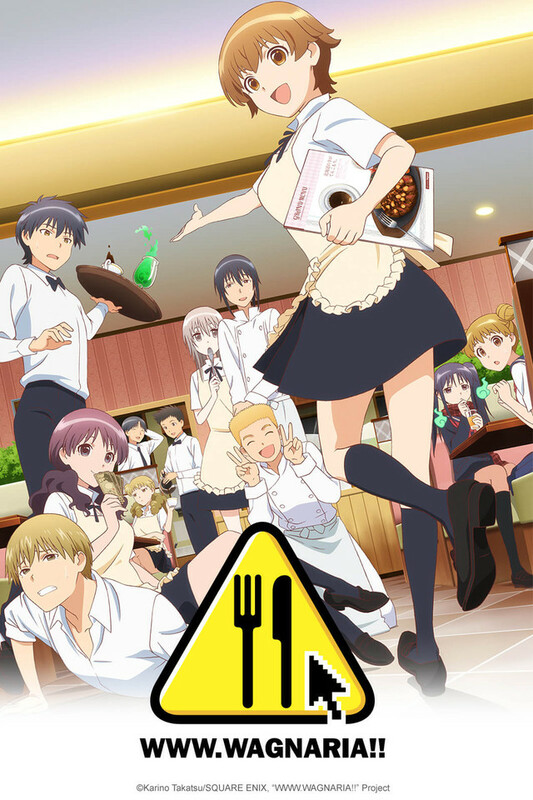 Unlike the first Wagnaria, I found it harder to connect to the characters due to lack of exposure but overall that is the only flaw I found in this wonderful series.